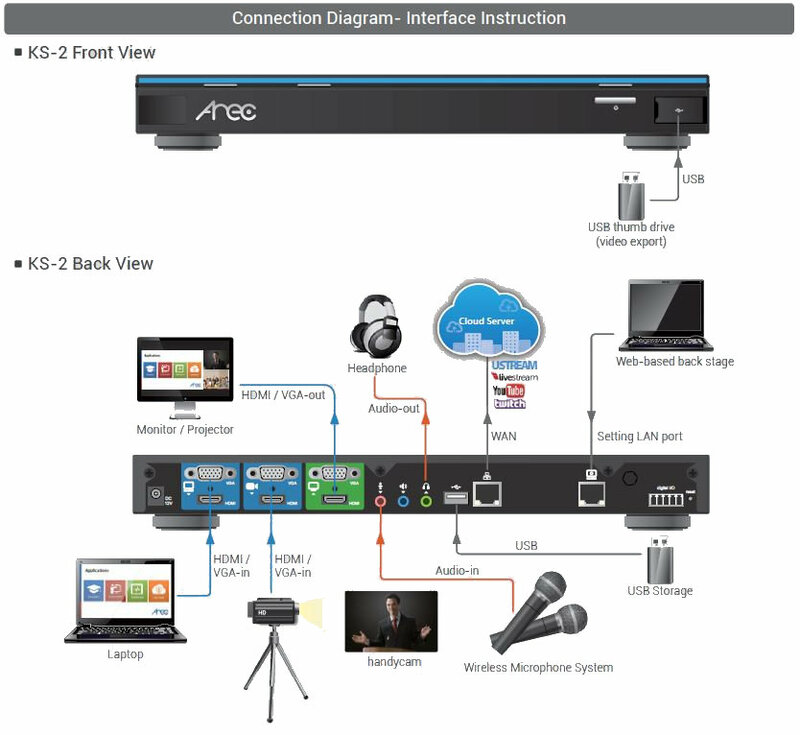 AREC KS-2 is a standalone, live streaming and recording station that allows you to capture, mix, switch, live stream and record 2-channel video simultaneously. With easy-to-use and 2-channel mixing/streaming features, AREC KS-2 makes broadcasting live video more interesting and useful than ever. 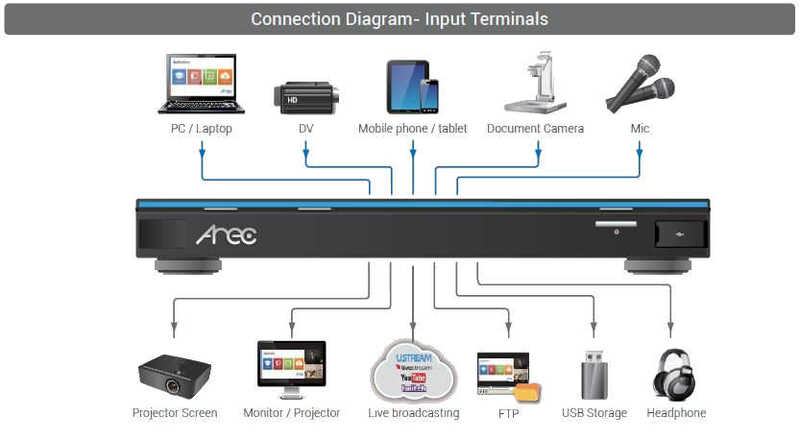 AREC KS-2 can stream live video while simultaneously recording to a USB external storage. With 2-channel sources steaming feature, users can broadcast an HD quality on-going lec-ture/event to an enterprise streaming server or live stream-ing website, such as YouTube and Twitch, allowing viewers to attend at any location through the Internet. AREC KS-2 supports synchronized 2 video capturing through HDMI and VGA, as well as DVI and Component via optional adapter. Audio recording is supported through 3.5mm stereo jacks and HDMI. KS-2 supports 2-input sources capturing and up to 3 synchronized recording videos. The 3 recording files includes 1 mixed video and 2 individual synchronized source videos for flexible post-production use. With the built-in Video Manager, administrators or teachers can manage videos stored in the local Media Station remotely, such as renaming/uploading/deleting a video file etc. AREC KS-2 is a standalone and stable media station that allows simply plug-ging in your existing digital camera and laptop content (1 or 2 video sources) to achieve live broadcasting and recording in extremely simple way. With a fully graphical user interface and a remote control, KS-2 allows for easy operation to minimize the learning curve required. Besides, AREC new table app*- “AREC Action!” can support KS-2 for video making. It allows users to switch and mix video sources and support monitoring the cameras’ field of view and streaming setting. * “AREC Action!” is free to download (available on iPad). FTP Backup Video files will be backed up automatically to FTP server after end of recording.